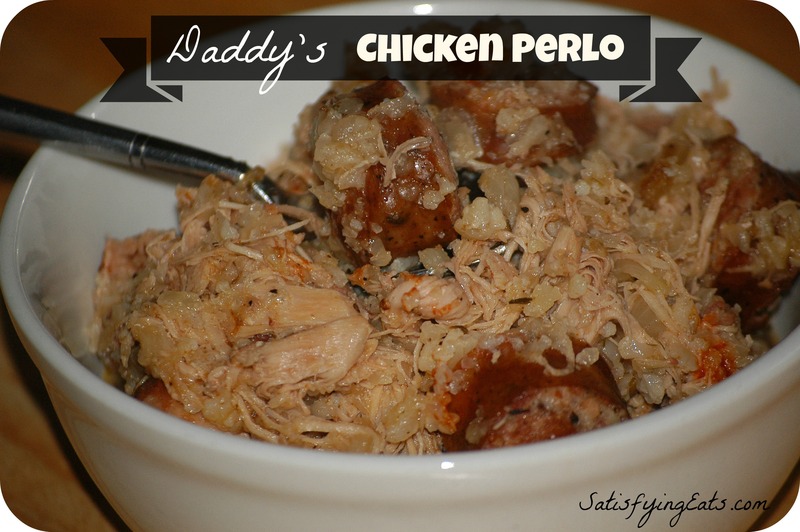 This recipe, Daddy’s Chicken Perlo, is featured in the Main Dishes section of Satisfying Eats Cookbook. When daddy cooked, he never followed a recipe. This was one of his specialties that he would cook for large crowds, especially at the local hunting club which I spent many Saturday’s with him as a young girl and then a young teenager. Chicken Perlo (as I knew it growing up) was a sticky rice dish with dark meat chicken, sausage, lots of black pepper, hot sauce and Fajita Seasonings. If the rice was fluffy and not sticky, it wasn’t Perlo. This is not Jambalaya! 😉 I remade the recipe for the cookbook using cauliflower and I think I captured the flavors that Daddy used. I have had so many compliments on the recipe I wanted to share it with everyone on Daddy’s birthday.As the saying goes, it is better to have loved and lost than never to have loved at all. I never understood this thought process until I lost my first love, my Daddy. It has been a little over 10 years since he left this earth and even though it hurts that he is not here to enjoy his grandson and to teach him life’s lessons that he taught me, I am still very happy that I have so many great memories with such a great man. Today would have been his 57th birthday so I am writing this post to honor his birthday and one of his most loved recipes. I hope you enjoy this comfort food. It comforts my tummy but it is so comforting to eat it and remember all of the good times I had with my Daddy! 9/22/13 Update: I just found out that the correct spelling of this dish is “pileau.” It’s funny, over 30 years later I am FINALLY learning how to spell this dish! Season chicken thighs liberally with salt and pepper. In large pot, melt butter (or coconut oil) and add chicken thighs to pan. Cook thighs on medium heat for 5 minutes then flip and cook for another 5 minutes. Add onions and garlic. Cook for another 2 minutes. Add remaining ingredients (2 cups of stock) and cook on low (uncovered) for 20 minutes or until chicken is done and most of stock has evaporated. Add the remaining more stock if needed. Taste for seasoning and serve with extra hot sauce. I cooked for 25 minutes and it is still soup…what did I do wrong? DELICIOUS!! My whole family loved it! Instead of cauliflower I used 1 1/2 cups of jasmine rice which absorbed the chicken broth very nicely! How long did you wait before adding uncooked jasmine rice to the mixture? If adding rice, I would add it at the same time as the stock. You may need more stock since the rice will soak it up. This looks so good. I want to definitely make! Glad your Daddy’s memory is such a blessing! Where does the name Perlo come from? Patricia, that is just what it was called..I have looked it up before and couldn’t find much on it…if I could only ask him! 😉 Yes, my dad was the best!! Carla, thank you so much for finally solving the mystery! I feel kind of silly not spelling it correctly but we never spelled it, we ate it! Thanks, Carla! So it comes from what I think of as Pilaf? I’ve been making it in the crockpot and it turns out more like soup, so I didn’t make that connection. It’s a great recipe either way, Melissa! OH.MY.WORD!! This is DELICIOUS!! I made this for lunch today. We are all enjoying it as we watch the Saints play 😉 Thank you yet again for another amazing recipe. Krissy, glad you enjoyed it! This was soupy for me too! Is it supposed to be? Kerry, be sure to cook for the 20-25 minutes without the lid to help the stock evaporate as the chicken cooks. It may take a few minutes more. If you want next time, you would also lessen the amount of stock. This is one of my favorites. I hope this helps! This recipe is absolutely delicious. I like mine with a little liquid. I added a bit more cauliflower and used about 2.5 cups of broth. I let mine cook and simmer for way longer than 25 minutes though. Thank you for the delicious recipe! I can’t wait to have a little more time to try out some others from your blog. I’m glad you enjoyed it Celia… it’s so simple but so delicious! This was AMAZING!!!!! I cooked pretty much the exact recipe except I added more Cajun Spices and a can of rinsed cannellini beans because I have been craving them for a while now. This recipe got 12 thumbs up from my family!!!! Thank you so much!